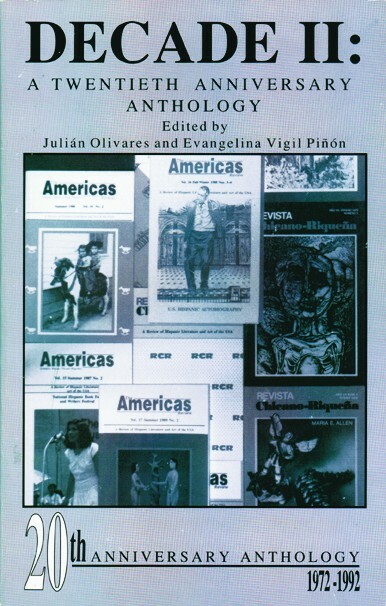 Decade II: an Anniversary Anthology is a select collection from Revista Chicano-Riqueña/The Americas Review during the decade of 1983-1992, and a celebration of the Twentieth Anniversary of the founding in 1973 of the most important U.S. Hispanic literary magazine. For twenty years RCR/TAR has been a vanguard literary review. In its pages first appeared writers who would develop into our major writers. Those interested in the history and excitement of Latino literature of the past decade would do well to savor the selections of this Anniversary Anthology. An introduction by Julián Olivares provides the historical and cultural context in which these works were created. Appearing alongside those writers whose works also appeared in the first anniversary Decade, are twenty-seven new and younger voices which speak of new experiences and from fresh perspectives, enriching and enlarging the horizon of U.S. Hispanic literature. EVANGELINA VIGIL PIÑÓN is the producer of several local Houston television programs, such as Viva la Raza: Latin Diversity in Houston and Community Close Up: Viva Houston. She is also a poet and a lecturer of Mexican-American literature and United States Hispanic Literature at the University of Houston.